That building is wunnerful in it's striposity. And I REEALLY love the clouds hanging out above it. They, too, wish to be so stripe-ed. 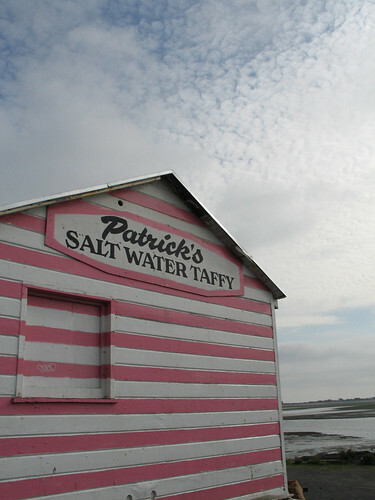 This is a great photo, composition-wise...the churning clouds and the cheerfully-pink building. oh my! What a wonderful building! i love that building! and the photo is amazing too. hope you are well. It's my ideal beach hut style. I only know of salt water taffy from the episode in Friends where Ross buys some for a girlfriend - it's all quite mystifying to me - but at least I now know why it should be such an attractive gift! By the way, I know I may be last person to see it, but I love your Kate pattern on Knitty. Well done! great photo of a great building... i love bodega bay! That building is one of my first memories -- I grew up going to Bodega Bay and have enjoyed many wax paper wrapped bits from that shop. You've captured it perfectly! that is a lovely building... and your day trip sounds so wonderful..